Liferay MVC is portlet frame work given by Liferay and it is specific to liferay environment. We already well aware of Liferay MVC frame work from Liferay Savvy previous articles. Please go through above three articles then you will be much aware of Liferay MVC framework and its use in portlet development. Now we will see how liferay portlet interact with database to store the data and fetch the data from database. Database interaction is like Insert, Delete, Read and Update the data in database. We already know there are many technologies in Java that is java applications connect to database and do CRUD operations. When we are talking about Database interaction in java application then we have a technology called JDBC. Similarly if we go little bit advanced concept then Hibernate comes into picture. Liferay also have used JDBC and Hibernate concepts to interact with database and it will perform CRUD operations. But we never write any legacy JDBC java code or Hibernate code when we work with database interactions and all the code already abstracted and we will use simple Util classes and its methods to perform operations. Liferay implemented many classes and interfaces so that we can develop database interaction portlet pretty easy. Liferay have implemented some classes and it use simple JDBC code to interact with database. These classes are available in Liferay Kernel level so that we can use anywhere in Plugin portlet development. We have class called DataAccess so that we can use this class to get the Connection object once we get the connection reaming all are like simple JDBC code to connect to database and perform operations. This is very Legacy JDBC code and we won’t use in real portlet development. We will use above method in some of specific scenarios. Liferay Service Builder is tool to generate database interaction layer/service layer to the portlet. Service layer consist of set of classes and interfaces so that we can use these classes to interact with database and perform database operation in portlet. Service Builder tool help us to generate service layer so that developer need not worry about persistence code and need to concentrate on business logic. Generally in the application development we need database service layer and the operations we used in persistence layer is common i.e. CRUD operations. Instead writing same CRUD operation persistence logic for multiple times we have a tool in Liferay so that it will be generated all classes and interfaces and developer need not to worry about persistence logic he/she can concentrate only on writing business logic. 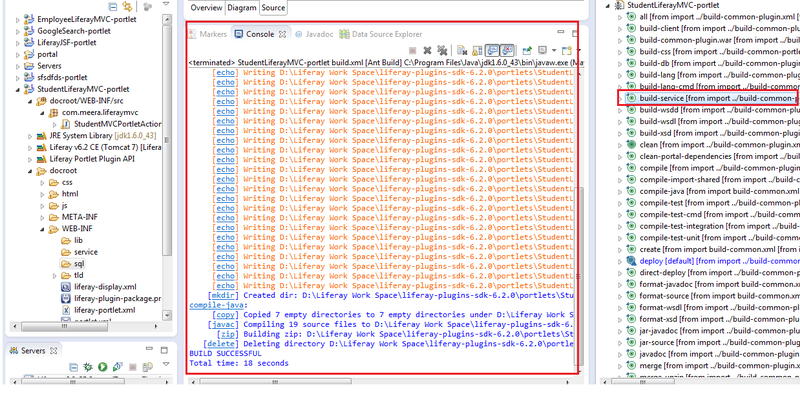 Liferay Service Builder is simple ANT script when we run ant target then all classes and interfaces will be created. When we create Liferay MVC Portlet using Plugins SDK then portlet consists of ANT build file and the build file have service builder related target by default. Liferay Service Builder used Spring Hibernate DAO implementation to create the services. After successfully run service builder we can see many configuration files and java implementation classes all are following spring hibernate DAO implementation mechanism. The following are the steps to Generate Service Layer in Portlet. Now we need to create service.xml file in portlet WEB-INF directory. This is the configuration file to service builder tool and Service Builder use configuration file to generate required services (classes, interfaces) to portlet and these services provided the database interactions from the portlet. In eclipse with Liferay IDE we have option to create service.xml with sample entity using GUI interface. We can also create manually in the above specified location or we can use Liferay IDE to create service.xml file. Now we need to defined required entities in service.xml file so that service builder will generate services for defined entities/tables. service.xml consist of defined tags from which we will define the entities. Tags information is available in service builder DTD file. When we define entity we need to specify primary key column, column data type, column name and other required things. All the tags information is based on its DTD. <!DOCTYPE service-builder PUBLIC "-//Liferay//DTD Service Builder 6.2.0//EN"
Once we run service builder it will generate many classes and interfaces. All interfaces will be packages as jar file and it will be available in WEB-INF/lib directory. It will also generate the required SQL script and it will be executed when we deploy the portlet so that required tables and indexes will be created in database. You can see the script in sql (docroot\WEB-INF\sql) directory of portlet. We already know we have used Student entity in service.xml so that we will get many services related to Student entity/table. We will use Util classes to interact with database. It will generate many classes and interfaces but we will use only Util java classes in portlet development. Mostly we will use Util class’s related methods to perform database CRUD operations. When we create or add record to the table first we need create persistence object and need to fill the data in object then finally add to the table using XXXLocalServiceUtil.addXXX() method.When we create persistence object we need a primary key so we will use CounterLocalServiceUtil.increment() to create unique id for the record. The following is code snippet to add record to the table. In the above code we are creating primary key using Counter Service. In the above code we are creating persistence object with new operator so primary key will be auto generated. In the both cases it will return student object if the record added successfully otherwise it will return null value. To update record first we need to get existed record with primary and need to fill new updated information in persistence object then we will update record. The following is code snippet to update record. Once data is updated it will return updated persistence object. We need primary key to delete the record. Once record is deleted it will return deleted persistence object. We have different methods to get the records we can get single record by primary key and we can fetch all records too. We can also fetch the record by using columns based these methods are available in XXXUtil methods. We have many finder methods and all finder methods will be available in XXXUtil class. To create any finder methods on required columns then we need to add configuration in service.xml file so that finder methods will be created to specific columns. We will see more about finder methods in future articles. The following are code snippets to fetch records. Service Builder is tool to generate database interaction layer to the portlet. Service Builder is simple ANT script and it has target to run the tool. Service Builder ANT target is available in portlet build.xml file by default so we can run target to generate service layer for portlet. Service Builder need service.xml file so that it will use those configuration to generate services. Service.xml file consist of set of predefined tags and it will be available in Service Builder DTD file. Service builder use the Spring Hibernate DAO implementation concept to generate services. Service Builder tool generate all java interfaces, implementation classes and spring hibernate configuration files, apart from these it will also generated required SQL scripts. SQL script will be run at time of portlet deployment it’s generally created table scripts and indexes scripts. For each modification in service.xml file or any other changes in service layer related classes we need to re run the service builder. ant build-service is target to run service builder. Service Builder packages all interfaces and required Util classes as porletName-portlet.jar file. Services jar file will be used in other portlet to obtain other portlet services. This is called sharing of services in other portlet. There are many things behind Liferay Service Builder we will see more details in coming articles.